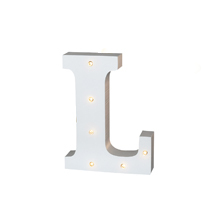 Light Up Letters are one of our favourite decorative trends whether for the home or for weddings. What better way to spell out your name than in lights. 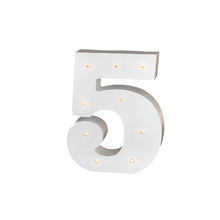 Choose from our selection of metal and wood letters, numbers, symbols, and phrases with battery operated LED lights. We also have large metal wedding designs; Mr & Mrs and Love, which make a wonderful backdrop for your wedding photographs. Part of the huge neon trend. Warm white LEDs (bulbs unscrew). 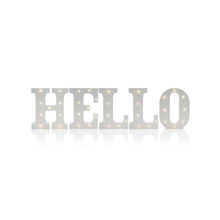 If you’re looking for a simple home update, something to stand out at a party or a personalised gift, which can be easily customised, illuminated LED letters are a perfect fit. 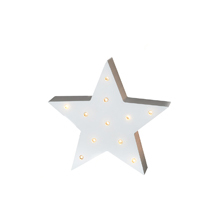 Accompanied with a light box, they can either be wall hung or sit on shelving and because they are battery operated you don’t need to worry about them being near a plug socket. Look for your initials or our ‘love’ sign for something personal or PARTY, COOK or DINNER if you like to host, there is something to fit no matter the event.